MAME on Modern Macs - A Knowledgebase - MAME® is a registered trademark of Nicola Salmoria. BGFX really rocks and after some MAME Updates, it became my standard shader. 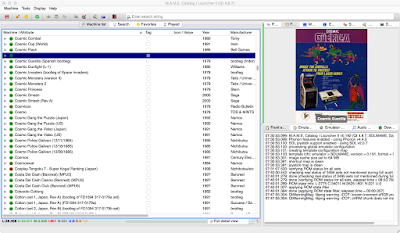 Update January 2019: MAME 206 corrects the HLSL shader, so the purple screen is gone. The 'Scale' values as described below are now in lines 186 and 191. Now I need to head for the new phosphor settings and update the below table for HLSL settings (I still do not like the default settings that much). Below you find the updated table of my current HLSL settings plus the Scale values for the lines 186 and 191. Update December 2018: Since the October 2018 release, the HLSL shader has been updated by phosphor settings. As a result, BGFX/HLSL produces a purple picture, at least on my Mac in both MacOS and Linux - is this an SDL MAME problem? I am still investigating into that, and for the time being, I stay with BGFX/CRT-GEOM-Deluxe, which still provides very decent results. Since both MacOS and Ubuntu is affected, this could point to an SLD problem. This bug makes the Attract Mode - MAME combination unusable because I need to force quite Attract Mode every single time I exit a MAME game. So if you have an older running system, it might be a good idea to avoid it for the time being. 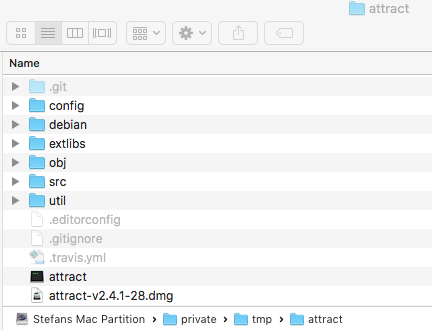 Update: Attract Mode 2.5 has been released - so grab the Mac binary and enjoy! Attract Mode has again become better. Now there is really nothing to complain on Macs as well. I also include instructions how to compile Attract Mode by yourself. (b) Homebrew recipies "pkg-config", "ffmpeg", "sfml" and "libarchive"
This creates a MacOS package for installing Attract Mode via Drag&Drop in the attract directory. Should you still hesitate, believe me: It is really worth the time. 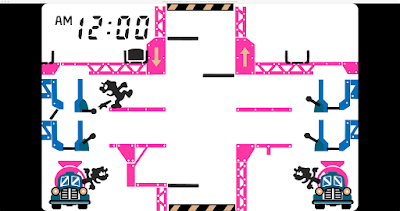 Best gaming experience you can get on your Mac. MAME 0.201 - Major BGFX Performance Achievements! As of MAME 0.201, you can run BGFX/Metal shaders along with Artwork bezels without taking a huge performance hit. This is really great news. BGFX/Metal is finally becoming stable on Macs. Attract Mode 2.4.0 is out - for MacOS as well! Very exiting news - after a very long time since version 2.0, there is a new version 2.4.0 out that also includes a MacOS bundle. 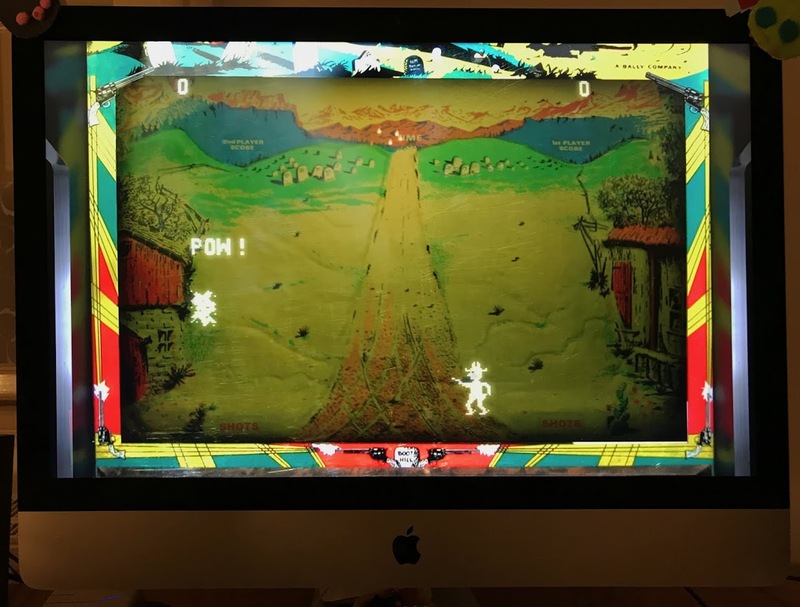 In this blog, you will find quite extensive articles about setting up a superior frontend for MAME under MacOS. All should work in this version as well. At first glance, everything seems to work just as it should, but I will do further thorough testing. It is just great to have an official MacOS release out again. If activated as Hot Corner, Attract Mode starts into the screensaver, and if you have your screensaver protected with your password, you can only shut down your Mac! This option disables moving the mouse to a corner -> another way of solving it. Be sure that your attract.cfg contains this line. 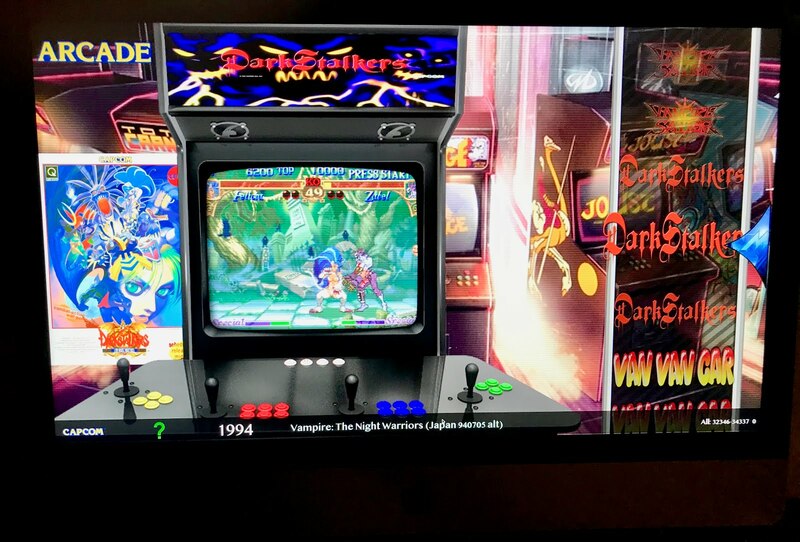 Mini Update November 2018: Since Retroarch/MacOS is still not ready for prime time, this is about testing out Retroarch, MAME official is still my favorite. So I have been testing out Retroarch for quite some time, and only as of the most recent Nighty 1.7.2 builds, I realized that it is time to switch from MAME to test out Retroarch. Here I will explain why I believe that Retroarch - even with old MAME Cores - can provide the best retrogaming experience so far. UPDATE 24 April 2018: Retroarch 1.7.2 is out as a stable build, so grab it here. 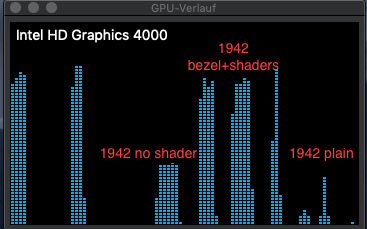 If your Mac has an NVidia Card, I recommend that you try out the CG version of Retroarch because it has an abundance of shaders on board. + The brand new Runahead feature of Retroarch 1.7.2 also works on MAME and is a game changer. 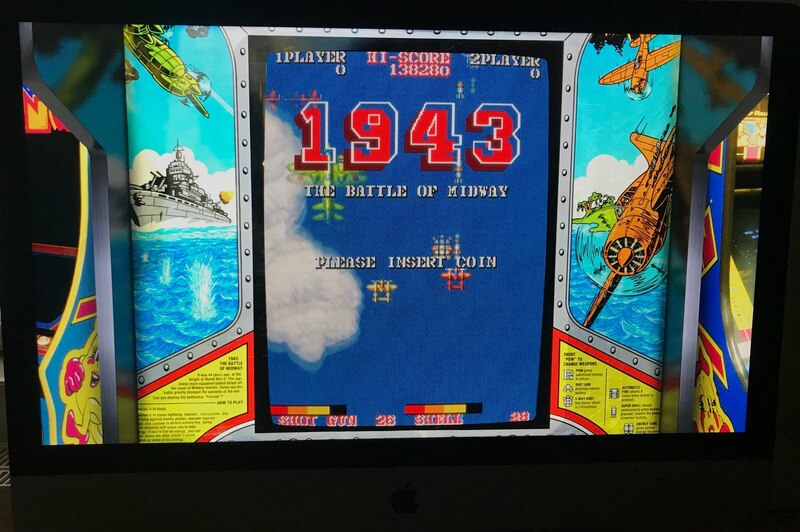 With a Runahead of two frames, the very snappy Arcade games, such as 1942, Pacman, Gyruss and the like, for the first time are as snappy as expected. If you are in games such as 1942, just try it in RetroArch with the 2 frames Runahead feature - and you will be blown away by its immediate snappyness. Note: For this crucial feature, you must install a Nightly Build of Retroarch on your Mac. + If you like to experiment with different shaders, Retroarch is paradise. In fact, you could be lost in the sheer amount of different shaders. In any case, it is safer to load the pre-defined Shader Presets. 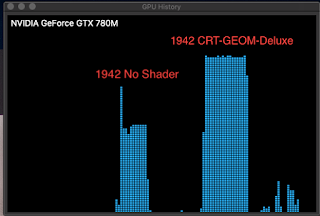 My favorite shader is called x4br-hybrid-crt.cg (it is also available in OpenGL). This shader brings a very attractive combination of xbr Scaling with crt-type scanlines. The results are very pleasing to me, a kind of slight modernization, but still with sufficient retro feeling. + Retroarch is already very strong in reckognizing joysticks from scratch. 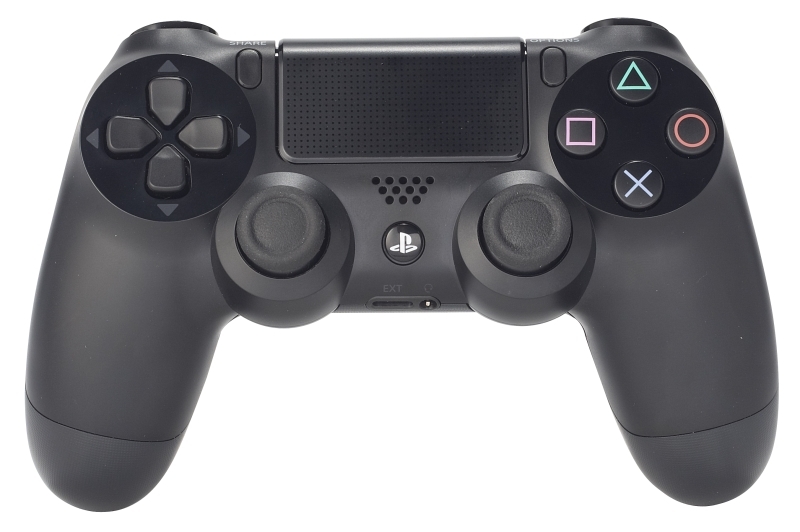 My PS4 joyapd via USB works extremely well. Combined with the Runahead feature, hardly to beat for me. + The MAME 2010 Core finally is ready for productive use. It has internal Highscore support out of the box, and most games just work very nicely. - The MAME current Core of Retroarch does not compile in MacOS, and neither does the Linux Core work on my machine. 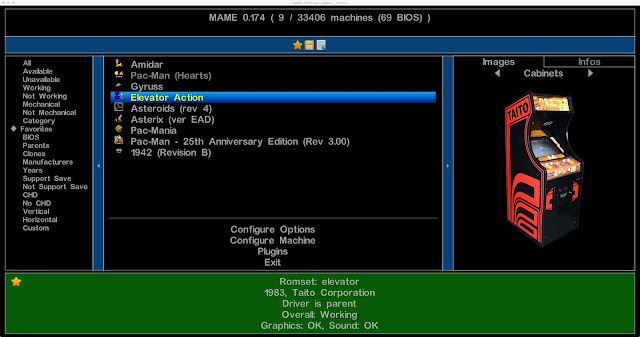 MAME 2010 works very well, so you miss out on all enhancements in MAME since 2010. If you are, like me, with Arcade Classics, you probably do not miss an awful lot. - With the different MAME Cores, Rom management becomes a challenge. You will have to deal much more with Rom problems, and Roms that work on one core by far do not always work on another Core. - In overall, Retroarch has a steep learning curve, but if you ask me, it's worth it for perfecting your Arcade game experience. Update since my tests: Unfortunately MAME 2010 proves to be buggy, I would love to explain in more detail, but can't. Some games crash after some time. So all in all, it is too early for me to move. From my first tests, MAME 0.195 is a nice build: It compiles nicely and has a running BGFX/Metal backend. I spotted some irregularities in BGFX, but all in all my favorite games seem to run smoothly. As always, the list of changes is overwhelming. As pointed out by the developers here, MAME 0.193 seems to have issues in BGFX - at least in the Windows build. 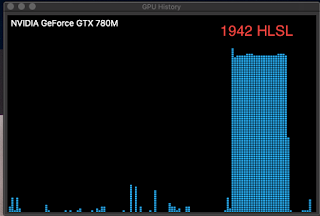 Although I did not encounter those in the official Mac build, it seems to me that the nothrottle command does not seem to work in BGFX because all games run at exactly 100% in BGFX. Important Update: I moved to MacOS High Sierra due to Spectre and the Meltdown. Here I see a consistent decrease of performance by up to -15% in the games I had tested before. This seems to be consistent with predictions in the tech community. This observation currently only applies to OpenGL, since BGFX for some reason does not execute the -nothrottle option in MAME 0.193. 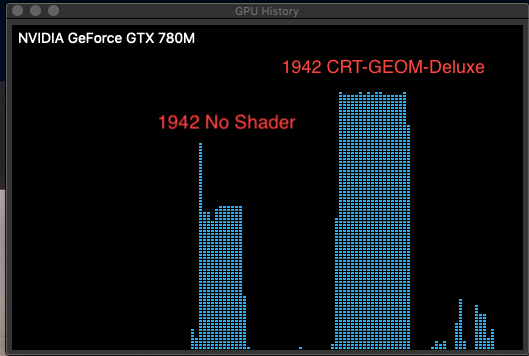 Before that, under MacOS Sierra, I had noticed quite significant performance gains under OpenGL/CRT-GEOM Deluxe of 10-20% in nothrottle mode. A very impressive summary and many nice screenshots. So that you know what you should test on your newer MAME systems. Update August 2018: No longer needed, Official Attract Mode 2.4 is out! MAME 0.192 and QMC2 0.192 Mac Binaries are here! A good release for MAME on Macs. QMC2 also compiles on Macs after some time. QMC2 looks very good so far, and I will review my QMC2 to-do's all over this Blog to be on par. Happy gambling! Performance Test Galore: MAME Performance on Three Operating Systems on one Mac Machine Compared! Focus of this test: How do BGFX shaders compare to other solutions if you add Artwork? My suspicion has always been that BGFX never can handle Artwork properly. Result: As soon as you add Artwork, BGFX performance completely goes down - on all three systems! The extreme results were very surprising for me, so in the end, it was worth the hassle. Further insights will follow here. For now, these are the detailed performance results (forgive me that I limited each run to 30 seconds ;-). With MAME 190 having been released, just a brief note on where MAME currently stands as it comes to the Mac environument. First and foremost, I see 21000 views on this site. Considering the narrow topic covered here, this is encouraging. So there are Mac users out there who are interested in MAME emulation. Thank you! And please do not hesitate to post if there is something to mention. 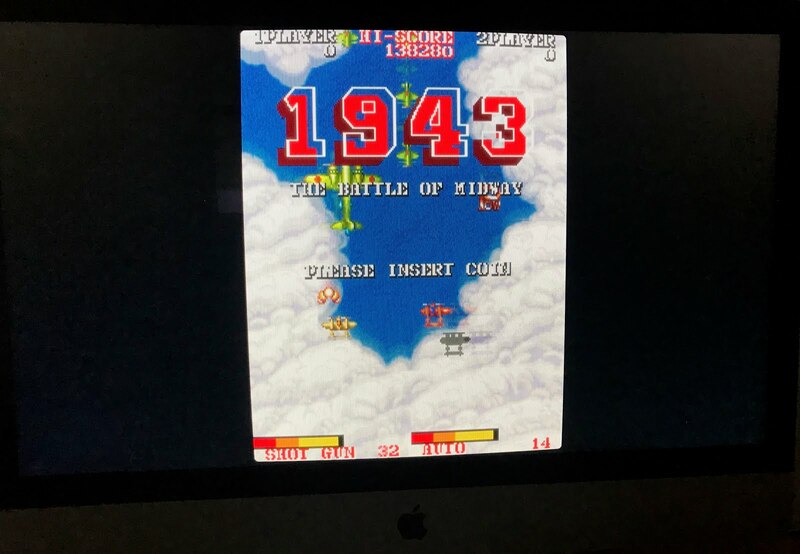 As you probably read in this blog, MAME works quite nice on modern Macs. As regards the Mac build, the METAL backend does not build properly in recent macOS systems. 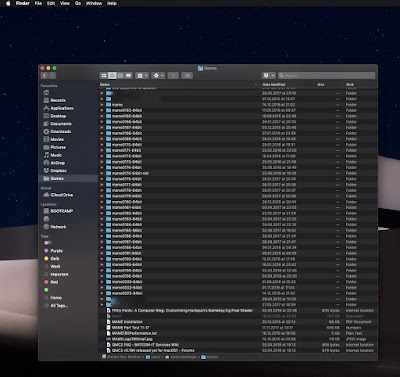 However, the official build from http://sdlmame.lngn.net/ is built on an older MacOSX system and has a working METAL backend. 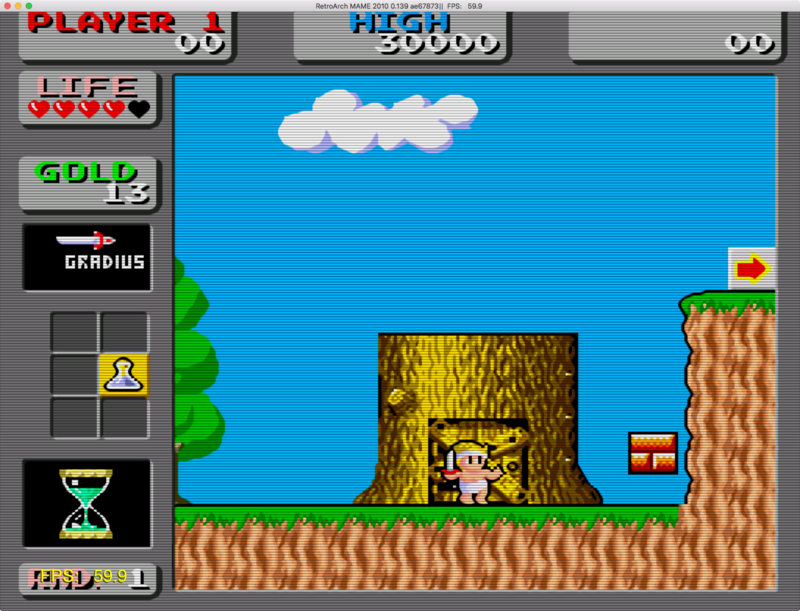 The build from http://choccyhobnob.com/mame/mame/ does not a working METAL backend, and same goes with my own build attempts. I would really like to write a bit about the Retroarch MAME core with its entirely different approach to game emulation. However, the MAME (current) core for macOS is also outdated since nearly a year and does not build. On modern Macs, I would not mess around with the (running) cores for MAME 2003 or 2014, unless you have a really old Mac machine. I sincerely hope that this will change because Retroarch would be another great option for Mac users. When it comes to frontends, QMC2 and Attract Mode are out there and in decent shape. This blog contains a lot of information on how to set them up on Macs. As for Attract Mode, I am a bit worried about the lack of updates for quite some time. But addmitedly it works nicely. The next big thing to come would probably be the High Sierra update, on which I will still be waiting a bit. With an 8bitdo Arcade Stick at home, playing could excel to new levels. And yes, still waiting for the Retroarch MAME core to come back to life. Cheers and happy gaming! Last week, MAME 0.188 arrived, as always, with a lot of improvements. 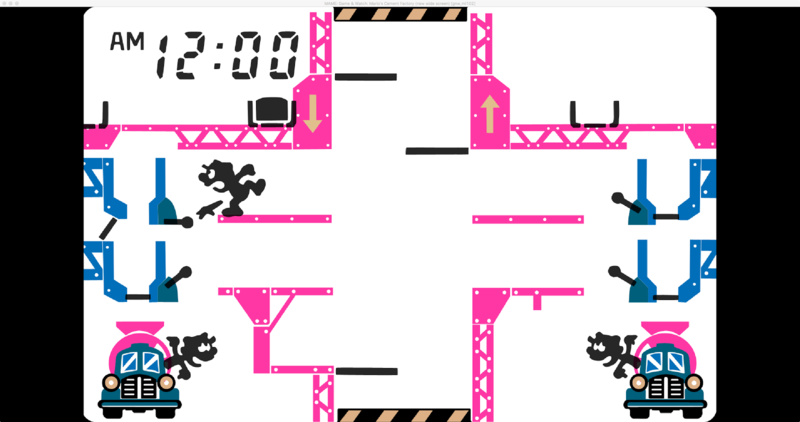 As regards game improvements, it is very nice to see that the first Game & Watch titles are released with SVG backgrounds built inside, so there is some very nice progress going on. So it might be that compiling under 10.12 does not work out nicely as far as the METAL backend is concerned ?!? As suggested by some of you, I gave Erockus Arcade a try. I was testing the new version 4. Unfortunately my testing did not turn out nicely. Here is a short summary. 1. Erockus is a bare bones frontend without any screenshot or even video preview options. This can fit you if you want to just head for the games and nothing else. But for many of us, MAME is not just playing, but it is about preserving the original feel. 2. 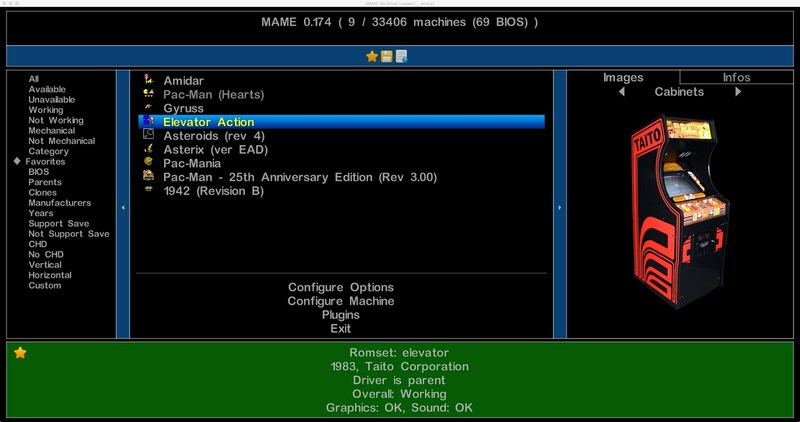 The Erockus configuration writes directly into your mame.ini and does not accept manual configuration (at least not of the options it directly handels). 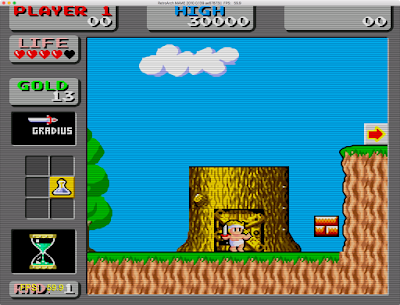 An existing mame.ini is backed up. This can be ok, if you are aware of it. 3. However, after three starts, Erockus stopped working on my system with the latest MacOS Sierra installed. After a startup time of more than two minutes (full romset), it ends up with an error. In my last attempt for this post, Erockus just froze after 3 minutes without any message, so I had to Force Quit. This is why I could not do any further testing, and I also cannot provide screenshots here. All in all, the software might be ok for your if you are looking for fast gameplay - if it works on your system. In my case, unfortunately.